Integra Business Solutions is delighted to announce the winners of its £20,000 Giveaway, launched to celebrate the group’s 20th Anniversary and to thank members for their continued support. Integra gave members the chance of winning one of 20 fantastic prizes worth £20,000 ranging from guaranteed 10% Initiative rebates, 10 pallets of Initiative paper, free marketing support up to the value of £1000 with VOW and a Samsung printer worth over £2,000. Apple products and Fitbits were also up for grabs together with a free year’s subscription to Inprint, Integra’s email marketing solution and CRM and sales solution, Sales-i. Integra received a fantastic response from members with many attending the ‘Celebrating 20 Years’ conference in September and others being entered for qualifying Initiative spend. 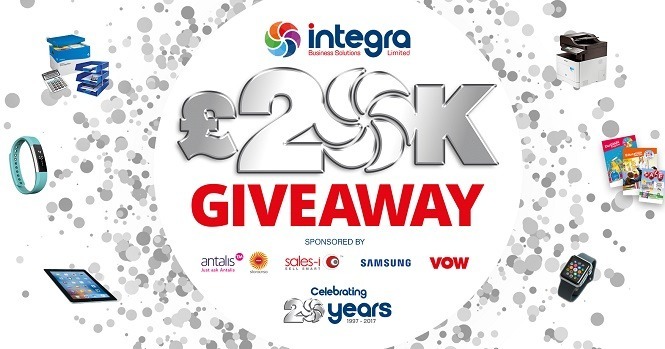 Integra would like to thank all of its key partners who supported the ‘Celebrating 20 Years’ Prize Giveaway; Antalis and Stora Enso, Sales-I, Samsung and VOW – for their continued support and extremely generous prize contributions which have all been very well received by winning members. A full list of winners and prizes can be found on Integra’s website www.integra-business.co.uk. Aidan McDonough, Integra’s CEO, commented: “We are delighted so many members benefitted from this fantastic promotion which has run alongside a host of other 20 Year incentives delivered by many of our key partners. It was a good way of thanking members for their support of both the group and the Initiative brand over the last 20 years. Integra looks forward to further celebrations in 2018 as it celebrates 20 Years of Initiative. Further promotions and incentives including overseas trips, price support and loyalty rebates are just a few of the 20 Year Initiative gifts planned for next year. A Celebration Conference is also planned with dates to be announced shortly. Dealer Support LIVE: Book today or miss out!